From fast, formation military demonstrations, to gravity-defying aerobatic acts to rocket-propelled trucks, parachutists, and a host of on-the-ground displays and activities, a day at the air show is a fantastic and memorable experience, whether you’re an avid aviation fan or just love a great show. Tens of millions of spectators attend air shows every year, and the air show industry represents one of the very largest, if not the largest, outdoor professional sports in North America. Conveniently priced for FREE, this event is for families and individuals of all ages, and is one show you won’t want to miss. March 23-24, 2019. The gates are open from 9 a.m. to 5 p.m. each day of the two-day show. A list of performers is constantly updated on the performer webpage. Unfortunately, the schedule is not solidified until the morning of the air show to allow for security, safety, weather and operational concerns. Please tune into Davis-Monthan AFB social media (Facebook, Twitter and Instragram) the day of the show for the published schedule. You can also download the DM app on the Apple and Google play stores for free to get all the latest information. NO. This air show is at a military airfield and you cannot fly-in. Are cameras, video recorders allowed? Yes, cameras and video recorders are allowed and encouraged to capture the memories. See our complete list of prohibited items, to know what you should leave at home. It takes more than a few drops of rain to stop the Davis Monthan Air Show. The air show will take place – rain or shine – both Saturday and Sunday. Air show performers have high, low and flat routines to adapt to varying weather conditions. Schedules may be altered or delayed for periods of time if heavy rainfall occurs. Please note that there are no refunds or rain checks for purchased tickets. What is the admission price for the Davis-Monthan Air Show? General admission is FREE! 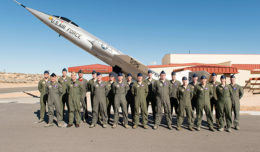 We want to showcase Davis-Monthan Air Force Base and all of the professional members of the Desert Lightning Team. Although admission is free, there are a limited number of premium seating options available for purchase while supply lasts. See Page 5. Enter Davis-Monthan Air Force Base via the Swan or Craycroft gates starting at 9 a.m. on Saturday and Sunday. You will be directed to the closest parking areas. Be advised that there are Handicapable spots available near the show entrance if you have proper vehicle identification. Expect a walk of up to a half mile from some of our further parking lots. Yes, a limited amount of bleacher seating is available. Yes, you may bring a lawn chair or folding chair. For your convenience, you may also rent a chair at the air show. Due to security concerns, coolers and large bags are not permitted on the show site. Small coolers for the purpose of carrying doctor prescribed, life-preserving medications are permitted. All personal handbags, totes, diaper bags, etc., are subject to search at the entry gates. Refer to the Air Show Tips and Prohibited items list for more ideas on what to bring and what not to bring. See Page 5. For the safety of attendees and the animals, pets are not allowed on show grounds. Certified service animals are permitted. Refer to the Air Show Tips and Prohibited items list for more ideas on what to bring and what not to bring. See Page 5. Shaded areas are available in the Thunderbolt Club, The Reserved Seats section and the Bier Garten. For General Admission, limited shade may be found under the wings of static display aircraft and under our sunshades. Guests are encouraged to bring sunscreen, hats and sunglasses. Refer to the Air Show Tips and Prohibited items list for more ideas on what to bring and what not to bring. Due to security and safety concerns, tents, beach umbrellas, awnings, and the like are not permitted on show grounds. Refer to the Air Show Tips and Prohibited items list for more ideas on what to bring and what not to bring. Is vegetarian or vegan food available? 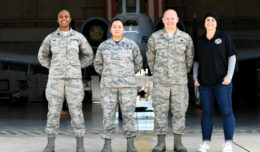 The air show will have a large variety of food available for purchase, including barbeque, pizza, local cuisines, friendly food specialties, dessert specialties and other concession services. Yes, medical personnel will be on site and a first aid center will be open. Please don’t hesitate to ask any air show personnel in uniform for medical assistance and they will point you in the right direction. Portable chairs, strollers, cameras, sunscreen, ear plugs, and blankets are items air show veterans tend to pack. Refer to the Air Show Tips and Prohibited items list for more ideas on what to bring and what not to bring. Please see our prohibited items list for a complete list of items not allowed at the Davis Monthan Air Force Base Airshow. How do I get there/home? General Admission should access the base via Swan or Craycroft gates. Once inside the base, follow the guidance of traffic management to the closest parking lot. Please refrain from using Uber or taxis based on the difficulty of getting a ride following the show. All lanes will be flowing outbound and this will cause a significant delay or a very long walk.